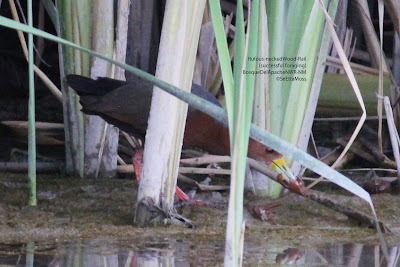 After an absence of more than 30 hours the Rufous-necked Wood-Rail made an appearance last evening after 7 pm. I got the photo above showing the bird with a food item in it's bill that I believe is a very large crawfish (aka crawdad) or similar creature. They are said to eat crabs primarily in their native mangrove habitat but they don't have crabs in New Mexico. It is best seen by clicking on above photo to enlarge it. So I don't chase rare birds much anymore and have never chased a rarity more than 150 miles. But when I saw this mega-rarity Rufous-necked Wood-Rail was found at Bosque del Apache NWR south of Albuquerque, which is great birding hotspot I haven't been to in some years, and it was being seen with a Least Bittern and they were out in the open--well, I decided there were too many interesting birds there to not drive down. And it has been worth the almost 500 mile drive. 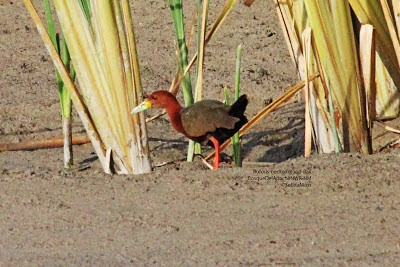 The top two pics show the Rufous-necked Wood-Rail as it foraged out in the open in shallow water. I love those bumble-gum pink legs. Pics #3 shows the Wood-Rail in the top of the pic, a Least Bittern out in the open (wow) in the middle and a Green Heron at the bottom--nice foraging friends. My neighborhood Gray Catbirds have been visiting me for a long time. 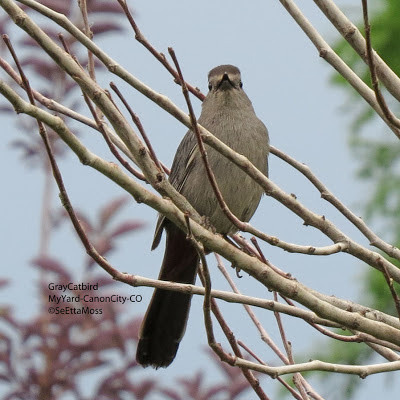 It started a number of years ago when a pair of Gray Catbirds nested right under my dining room window–what wonderful intimate views I had. Unfortunately I had to clean up the very overgrown shrub in which they nested so they haven’t nested in my yard since; but they do come to visit–well, they come to eat here anyway. They like insects as well as small fruit and berries so planting those and avoiding the use of pesticides is important in having a catbird-friendly yard. And the male, or males, engage with me in duetting–or I engage them. They have also brought their offspring back to my yard each year–though I like to think they bring them to show them to me, it is most likely for the food and safety that is provided in my bird-friendly yard.